A few of my absolute favorite party ideas for the 4th from you-know-who...grosgrain and stripes? Candy flags? Yes, please. 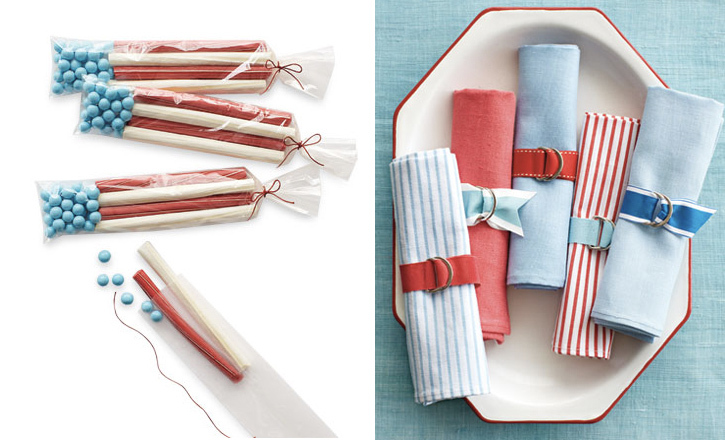 These are two darling Independence Day ideas I have at the top of my list. I think taking the time to make those little napkin rings/belts would be a bit more time consuming that I'd consider ideal, but they could also be used year after year (and even on other occasions too). You can find all of the how-to's here...just start flipping through the slides. Thank you for referring to it as Independence Day. I don't like holidays being renamed to their dates. Happy 4th! It's beautiful here in Seattle, isn't it? I wish I'd seen this last week. Great. I love your blog and was so excited to see you are on Pinterest. I just discovered that site a few days ago and am loving it! Your stuff is great.